Find fun, local singles near you – anywhere, anytime. Download the QuestChat app for iOS or Android and start meeting exciting new singles today. Connect live with voice, strike up a flirty conversation with text, or exchange photos and videos. QuestChat for iOS is the obvious choice for singles looking to connect! You’ll love all the features and messaging options. You’ve got to try it! 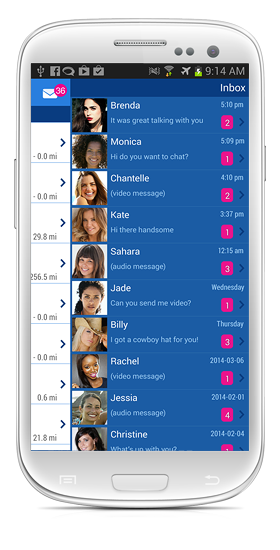 QuestChat Dating App on your Android phone today. Everybody’s using QuestChat – why aren’t you? I just started using this app 2 days ago and love it so far! I never would have met my husband if it wasn't for QuestChat. Thanks Quest! The Quest App is really easy, fun and always very interesting! Share snapshots of who you are and what you love with photo messaging. Show off your mood, what you’re up to, and learn more about other singles by sending and receiving photos from anywhere, at any time. Show them what you’ve got! Are you ready to take the conversation up a notch? Send a video message to show off your personality and really get to know the other singles on QuestChat! Receive messages from other singles, see what they look like and how they sound – all from the comfort of home. See a profile you like? Send them a message! Get flirty with text messaging and show off your adventurous side, all while keeping your contact information totally confidential. Text messaging is fast, safe, and always fun. Chat live over the phone using QuestChat’s voice feature. Stay in for the night and meet more singles than you would at the bar! Have a blast getting to know each other better. Don’t worry, your contact info is kept confidential. Control the distance between you and your profile matches by tapping “Update Your Location”. You’ll automatically see nearby profiles first, then we’ll show you everyone else a little further away. You’ll have a blast checking out all the great QuestChat singles! Never lose a favourite profile again. Add it to your Hotlist for easy access! After meeting someone you know you’ll want to chat with again, be sure to add their profile to your Hotlist. You’ll be able to quickly find them and strike up a conversation the next time they’re online.